Chorley launched their new National League North season with an encouraging 1-0 victory over Kidderminster at Aggborough. 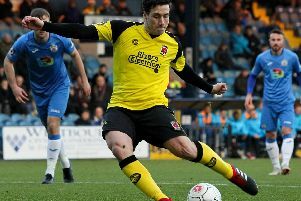 Having ended Harriers’ season in May with a 2-0 win in the play-off semi-final, Matt Jansen’s men returned to complete a third clean-sheet in three visits. They once again frustrated the home side and their fans with a trademark away performance. Their success was built on solid defensive cover but also on tremendous work-rate across the park. ‘The boys have put in an unbelievable shift here against a full-time team,” said Jansen. His opposite number John Eustace was typically candid and generous in acknowledging the Magpies’ strengths. “Chorley are one of the best teams in the league with a top manager and an experienced set of lads who know their jobs,” he said. The game itself never reached great heights. Kidderminster controlled much of the play but found the visitors’ defence in uncompromising mood – and when they did break through Matt Urwin– signed on a season-long loan from Fleetwood Town – showed a very safe pair of hands. In a strong Harriers’ opening spell, Tyrone Williams headed narrowly wide, while crucial blocks or interventions nullified other goal-attempts. For Chorley, Terry Gornell was off-target with a quickly-taken half-chance. The action livened up after the interval and Harriers looked all set to go in front on the hour when Joe Ironside met a centre with a powerful near-post header destined for the top corner, only for Urwin to pull off a top-drawer save. Five minutes later came Chorley’s first clear chance when Marcus Carver curled an inviting ball onto the head of Gornell but his effort flew disappointingly straight at keeper Brendon Hall. The Magpies’ winner on 79 minutes had a touch of good fortune about it. Adam Blakeman put in a driven low cross which the luckless Williams diverted into his own net past a wrong-footed Hall. The home side made valiant late efforts to save the game but produced nothing to seriously trouble the redoubtable Urwin and his defence. On a day of bizarre statistics inthe National League North, Chorley’s win was of enhanced value. The eleven matches produced not a single draw, while of the defeated teams no fewer than eight failed to score. CHORLEY : Urwin, Challoner, Blakeman, Teague, Leather, Jordan, O’Keefe, Whitham, Carver, Gornell, Wilson. Subs. Charnock, Jarvis, Walker, Roscoe, Likoy-Elumba.